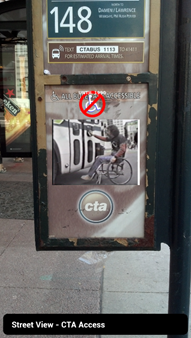 “Street View – CTA Access” is a work that looks at the struggle people with disabilities have had trying to access Chicago’s buses. Today many people take for granted the accommodations they see on our buses that make it possible for so many citizens to get to work, school, store and play. But without a concerted effort by ADAPT (American Disabled for Accessible Public Transit) and the disability rights movement to take the struggle to the courtrooms and to the streets, they would not have won the landmark law suit in 1988 calling for the Chicago Transit Authority (CTA) to stop discriminating against people with disabilities. 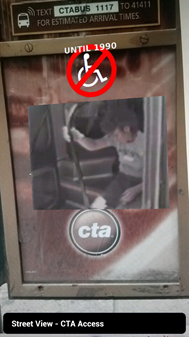 “Jones vs. CTA” mandated accessible buses in Chicago and was a significant milestone leading to the passage of the Americans with Disabilities Act. 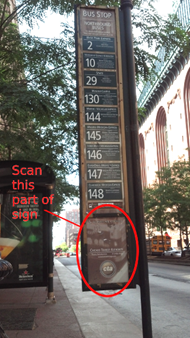 “Street View” provides a unique point of view of our streets by using public markers represented in signs and images as launching points for the forgotten or untold stories of change by people who “took to the streets”. Using mobile AR technology, viewers will see historic images and video clips in the context of where the events occurred. This augmented view is layered on the live camera view of their mobile device (smartphone) giving site specific meaning to the media. The video clips contain audio and there can be significant street noise at these locations, so for the best experience viewers should wear headphones. Users of newer mobile devices will see a video clip embedded in the camera image while older devices will display the video in the built in player. Drew Browning is an electronic artist/designer whose work began with the video art movement of the early '70s, including interactive video installations and video performances, and who now focuses on interactive digital media and virtual reality. His work is about creating dialog around issues of difference, about using the power of technology to challenge viewer perspective, and about calling attention to what makes us human. He is involved in research and development of technology for persons with disabilities and universal design. Browning is an Emeritus Professor of Electronic Visualization and Industrial Design and founder of the Design Visualization Lab at the University of Illinois at Chicago. Recent works include data driven sculpture (Approach, Prairie Center of the Arts, Peoria 2012 and River Benches, Slane Scholar in Residence, Bradley University 2006), interactive installations (Puff, IDMAa Conference 2011 and Elevator Music, Site Unseen, Chicago Cultural Center 2009) and video (Fragile, SCAN2GO Catalog, CAA Conference 2012 and Winds of Change, IDMAa Conference 2011 and New Media Festival Los Angeles 2012). “Street View – CTA Access” is part of Expose, Intervene, Occupy: Re-interpreting Public Space an augmented reality project that interrogates the meaning of public space using models, images, text, and movies overlaid on locations in Chicago’s Loop. Expose, Intervene, Occupy is supported in part by the Propeller Fund.